The following policies relate to your stay at the Times Square Suites. Please take the time to review these policies. Should you have any questions or concerns, please contact us at your earliest convenience. Cancellations must be provided in WRITING, either by email (info@timessquaresuites.com) or fax (1.604.684.2225). 48 Hours (2 nights) notice prior to arrival is required in order to avoid a penalty charge of 1 (one) night plus taxes. One week (7 nights) notice prior to arrival for long term 30 nights (one month) or more reservations is required in order to avoid a penalty charge of 7 (seven) nights plus taxes. After check in, early departures are charged for the ENTIRE reservation amount with no refunds. Advance Purchase Rate: Full prepayment is due at time of booking and is non-refundable, non-changeable & non-transferable. Cardholder must be present at time of check-in and produce the credit card used for payment as well as photo identification. Early check outs are charged at the full amount. No refunds. In case of true emergency no penalty will be assessed by the hotel (customer is required to provide proof). Any changes made on the day of arrival or during the stay, the full length of stay will be charged. No refunds. 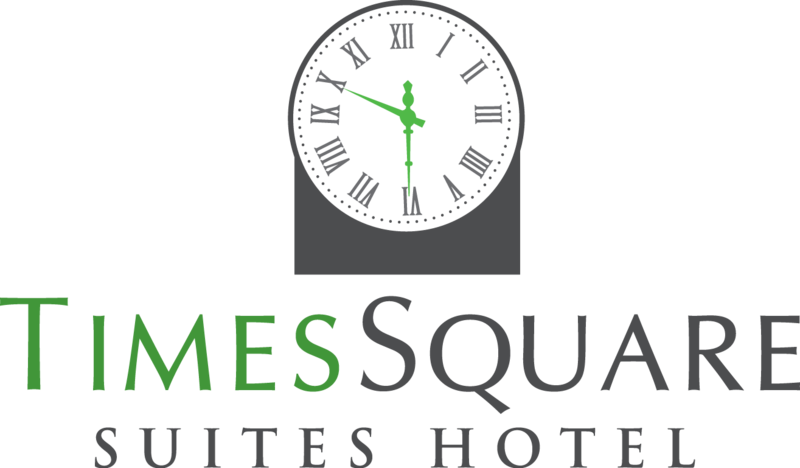 In-house Long Stay (30 days stay or longer) clients wishing to depart before their scheduled departure date are required to give Times Square Suites 7 days notice in order to avoid a charge of 7 days. If the change results in a stay of less than 30 days in duration, the nightly rate will revert to the best available daily or weekly rate and is subject to the addition of applicable taxes. Why is your policy different than other hotels? Based on our size and location, we do not have the volume of walk in traffic (those arriving randomly without a reservation) that larger hotels with a recognized brand have. For this reason, when a last minute cancellation happens, we cannot guarantee that we will be able to resell the suite. We will do our best to honour specific suite requests though cannot guarantee them. We will ensure that suite type is maintained though an upgrade may be implemented without advanced notification. Our Large 2 Bedroom and Two bedroom/Two bathroom suite configurations have a king bed in the second bedroom. Twin beds are available ON REQUEST - in advance of arrival. Times Square Suites is a non-smoking hotel. This means that all suites and balconies are non-smoking (including e-cigarettes). Should a guest smoke in a suite or on a balcony there will be a $500.00CAD charge for resetting (including painting) the suite to non-smoking standards. We are happy to provide a designated cigarette smoking area on the rooftop patio for our guests and we appreciate your cooperation in this matter. Each suite is priced based on a set number of adults. An additional adult in the suite is subject to a $20CAD per night fee and must use existing beds (including sofabed). There is a maximum occupancy for each type of suite. If you have any questions, please contact us prior to making your reservation. Children under 12 are free when using existing beds (including the sofabed). Times Square Suites has cribs and cots which are available upon request. Please advise us prior to arrival. Daily cost is $5CAD + tax. Please be mindful of other guests in the hotel and keep noise levels to a minimum. This hotel has a zero tolerance noise policy. If there is a noise complaint from other guests or neighbours, you will be issued a warning. If there is a second noise complaint, you will be asked to leave the hotel premises without a refund. No underage drinking or illegal substances are permitted in the hotel. Either of these violations will result in immediate expulsion from the hotel premises and the involvement of law enforcement. The person who rented and signed for the hotel suite will be charged for any damages or theft sustained in the suite which you occupy, any hotel property damaged by you or your guest or noise which impacts another guests' overnight experience. *Times Square Suites Hotel is not responsible for guest personal items. Theft or damage is the responsibility of the guest inside the hotel, parking lots and common areas. We have parking available for $15CAD nightly plus tax in our underground parking garage. The clearance of the garage is 6'4"/1.94m. You do not need to reserve a parking space, though please contact us if you will have an overheight vehicle. We allow one small pet in some suites on our second floor only. Suites with a pet must be pre-assigned and therefore your pet's stay must be confirmed by us prior to arrival. We have a minimum three nights stay with a charge of $45 and $15 each additional night. There is a max. charge of $100. Our pet fees cover the cleaning company fee after you and your pet check out. Guests with pets who do not pre-confirm may be denied accommodation on arrival if we do not have a suite on the second floor available. Maximum of one pet per suite. Pets must not be left unattended in the suite. Noise violations will be subject to our conduct guidelines noted on our website. Please note that due to allergy reasons, we do not allow non-guest visitors with pet/s in the suites or common places in the establishment (i.e. elevator, rooftop etc). Violation is subject to a $200CAD fine which will be used for professional cleaning/sanitizing of the suite or area. *Please note in May, June, July, August and September we do not allow pets.